Rincon Research Corporation filed an application for special temporary authority “to allow a series of highly accurate HF ionospheric propagation measurements to be made in order to characterize time-varying effects that limit the ability to geolocate uncooperative HF transmitters. The collected RF data is required to develop a parametric channel model that can be used to correct for variability in time of arrival and frequency of arrival for signals associated with near-vertical-incident-skywave (NVIS) communication networks. Current ionospheric sounding systems (e.g., Digisondes) do not provide this unique type of information.” Operation will be on 4-12 MHz at Tucson, Arizona. Rockwell Collins filed an application for special temporary authority to test the “capability of Cognitive networked electronic warfare software system in detecting, identifying, locating and determining friend/foe/neutral of all RF emitters.” “The purpose of this experiment is to demonstrate innovative technologies such as the situation awareness of RF emitters in the field to various Special Operations Forces (SOF) operators that have the potential to provide enhanced capabilities to SOF warfighters.” Operation will be in several bands between 144 MHz and 4.9 GHz in Butlerville, Indiana. ArduSat Inc. filed an application with exhibit for special temporary authority to “uplink telecommand signals to the ArduSat-1 satellite, and to download gathered data from the satellite. ArduSat, short for ‘Arduino Satellite’, is an educational nanosatellite built in the CubeSat form factor that carries a suite of sensors and an experimental Arduino-based payload computer that can be reprogrammed while in space.” Operation will be on 437 MHz with the uplink at San Francisco. NIITEK filed an application with exhibits for special temporary authority to develop and test a ground penetrating radar, utilizing ultra-sideband (UWB) technology, which is a component of the company’s landline detection system. Operation will be on 200-7000 MHz at Dulles and Charlottesville, Virginia. Space Data Corporation filed an application with exhibit for special temporary authority to “conduct research trials to determine the compatibility of the LTE wireless protocol with Space Data’s near space platform network.” “Space Data intends to conduct the trials using standard commercially available LTE-based public safety user devices to determine if such an approach can be useful in rapidly restoring LTE coverage during the first 72 hours immediately following a disaster that causes outages in terrestrial LTE networks or in areas where terrestrial LTE coverage is unavailable. 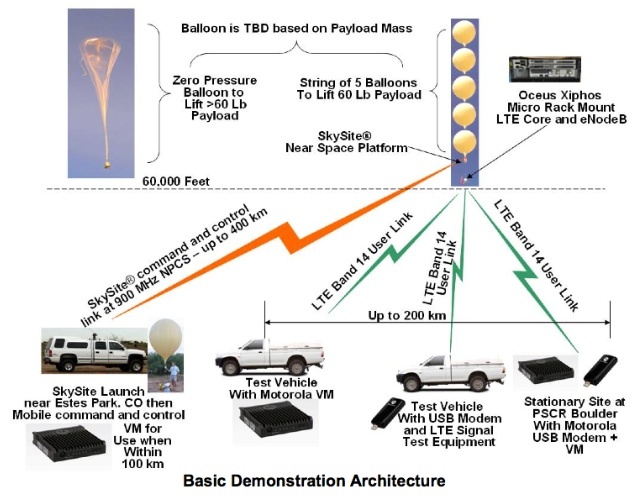 It is anticipated that the results of these trials will be filed as ex parte comments in the Commission’s ongoing Notice of Inquiry regarding Deployable Aerial Communications Architecture (DACA).” “A series of high altitude balloon craft will carry LTE-based transceivers and float at altitudes between 65,000 and 90,000 feet. The flight altitude will be adjusted based on the winds at the float altitude. Once at altitude, the LTE transceiver will allow land-based LTE user equipment to establish test data sessions.” Operation will be in Arizona and Colorado on 758-768 and 788-798 MHz. Harris filed an application with exhibits for special temporary authority to demonstrate “tactical cellular capability over commercially licensed spectrum” “to various Special Operations Forces (SOF).” Harris says the technologies have the “potential to provide enhanced capabilities to SOF warfighters.” Operation will be on 777-787, 2156-2161, and 2164-2169 MHz at Butlerville, Indiana. Tecore Government Services filed an application with exhibits for special temporary authority to test a “managed access system at the Maryland Metropolitan Transition Center in Baltimore, Maryland to interdict contraband wireless devices in the prison.” Operation is to be on several mobile broadband bands in the 824.04-2120.00 MHz range. SRC filed an application with exhibits for experimental license to test a radar system intended to detect birds and aircraft near wind turbines. Operation will be on 1225 MHz near Rolling Hills, Wyoming. TrellisWare Technologies filed an application with exhibit for experimental license to conduct tests supporting the sending and receiving of voice communications, data, and streaming video in a combat environment. TrellisWare says it “is currently under a Small Business Innovative Research (SBIR) contract with DARPA for the Robotics Streaming Video Program (RSVP). The objective of the contract is to leverage existing communications hardware to demonstrate representative robotics communications in field tests in operationally relevant environments and deployment scenarios.” Testing will be in Arlington, Virginia on 1775-1795 MHz. Hewlett-Packard filed an application with exhibit for experimental license to study “building localization/positioning of UEs connected to low-power enterprise 3G-based enterprise radio access network.” Operation will be on several bands between 1940 and 2155 MHz at Palo Alto, California. Google filed an application for special temporary authority to test “throughput and stability of home WiFi networks using a next generation personal communication device. Please see Attachment 1 for narrative response.” (Attachment 1 is not found in the FCC’s database, perhaps because of a confidentiality request.) “On January 26, 2012, Google Inc. (“Google”) was granted special temporary authority (STA) to test a next-generation personal communications device (Call Sign WF9XKU). The STA was extended to December 15, 2012, see File No. 0448-EX-ST-2012, in order to ensure that Google could continue testing until receipt of equipment authorization, which Google anticipated receiving in the fourth quarter of this year. Google now expects to receive equipment authorization early in the first quarter of 2013, having made minor changes to the device. Consequently, Google requests a brief extension of the STA, until January 31, 2013, so that it may continue operations pending receipt of authorization. Google also requests approval to make minor changes to the number of devices currently approved at two locations, without changing the total number of devices.” Operation was to be in several cities on 2400-2483 MHz. Lockheed Martin filed an application and exhibit for special temporary authority “in support of test and demonstration activity that will require the transmittal of GPS data from an Inertial Navigation System (INS)” onboard “a fielded All Terrain Vehicle (ATV) to a laboratory at a distance of no greater than 1 kilometer. The Gun Fire Control Lab supports the development of gun fire control algorithms used to control various vehicle turrets while operating in dynamic environments. The purpose of this activity is to demonstrate turret pointing capabilities and to test pointing accuracy when tracking a non-stationary target. The hardware requiring licensing will provide a data link between the laboratory and the ATV that will enable the transmittal of real-time GPS data.” Operaiton will be on 2.4000-2.4835 GHz at Grand Prairie, Texas. Raytheon BBN Technologies filed an application with exhibits for special temporary authority to test a security sensor system. “The sensors detect motion and report activity back via their integrated, wireless communications network to a centralized command and control station that is monitored by site security personnel. 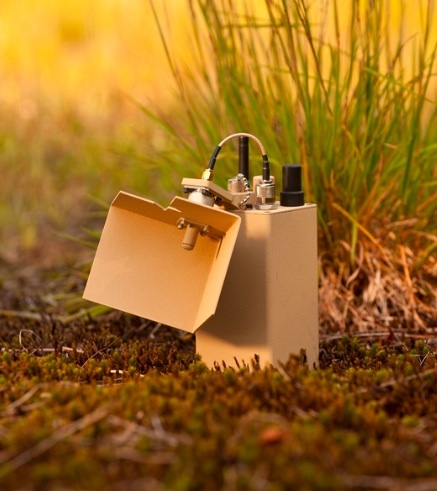 The sensors will be installed in an area that is difficult to patrol on foot by the nature of the surrounding environment.” The modulating signal is described as a series of 20ns pulses sent for a maximum duration of 25ms at rates varying between 312.5-500 kHz. Operation will be on 3.5 GHz at the Tobyhanna Army Depot in Tobyhanna, Pennsylvania. MIT Lincoln Laboratory filed an application for special temporary authority to operate on 3.65-3.70 GHz using the IEEE 802.11g standard to test “control algorithms for multiple unmanned vehicles (both ground and air vehicles) for enclosed spaces (buildings).” Operation will take place in Lexington, Massachusetts. Boeing filed an application with exhibit for experimental license to conduct experimental testing and development of telemetry transmitters that will operate in the C band. The testing will verify operations from aircraft to ground stations during actual flight test events. One test is to verify that operation will work over a distance of 250 miles from the aircraft to the ground station. This work is to support verification of the 4400-4950 MHz band allocated for telemetry use during World Radio Conference (WRC) 2007. Operation will be in the vicinity of Berkeley, Missouri on 4665 and 4685 MHz. South.com, LLC filed an application with exhibit for special temporary authority “to conduct experimental testing of two-way wireless backhaul services in the Cheyenne, Wyoming Designated Market Area (“DMA”) area prior to further assessing the business case for potential full-scale deployment of Multichannel Video and Data Distribution Services (“MVDDS”) at 12.2-12.7 GHz.” “In South’s view, successful deployment of MVDDS services is critically dependent on being able to incorporate innovative services into its parent company’s (DISH) far-reaching business plans. Wireless backhaul services would effectively complement DISH’s nascent nationwide wireless plans. Additionally, even though wireless backhaul is a two-way service, it is a point-to-point service, and therefore it realistically is operating a one-way transmit path, albeit on two different frequencies segments. Because of various uncertainties regarding the ability to offer effective two-way services under the MVDDS Part 101 power limits, this STA will be used to evaluate whether wireless backhaul is a viable MVDDS service offering. As described below, the testing would use a combination of interference mitigation factors to prevent harmful interference to incumbent operations (specifically DBS receive dishes) including utilizing a narrow beamwidth antenna suitable for microwave backhaul, which prevents exceeding the applicable EPFD protection levels.” Operation will be in Cheyenne, Wyoming on 12.225-12.325 and 12.575-12.675 GHz. Note: After this post, I’m going to try changing the way I cover these applications. Instead of providing a summary every few months, I plan to write about the applications as I discover them. This will mean coverage that is more timely, and I hope more complete as I will be able to focus on one or a few applications at a time. By clicking on “Experimental” in the tag cloud, you’ll be able to see the most recent experimental posts and generate your own “summary” at any time. This entry was posted on Thursday, January 3rd, 2013 at 5:18 am and is filed under 3G, 4G, Ad-hoc Networks, Aviation, Backhaul, Cognitive Radio, Contraband Cell Phones, Electronic Warfare, Experimental, GPS, Ground Penetrating Radar, Heterogeneous Networks, High Frequency, Low Frequency, LTE, Managed Access, Medium Frequency, Military, Mobile Broadband, MVDDS, Propagation, Radar, Satellite, Sensors, Space Communications, Synthetic Aperture Radar, Telemetry, Ultra-wideband, Uncategorized, Wi-Fi. You can follow any responses to this entry through the RSS 2.0 feed. You can leave a response, or trackback from your own site.